Many marketers know that you and your peers are fixating on these parabolic charts. It’s going to end in tears, but they don’t care. They know they can get your attention now with a weed-fueled promise of 100% to 1,000%+ gains. This time last year, the fad was Bitcoin-related investments. Sadly, anyone who “bought the early dip” this time last year with $1,000,000 in the cryptocurrency “blue chip” has only $337,000 to their name today. And they didn’t collect any dividends along the way, either! 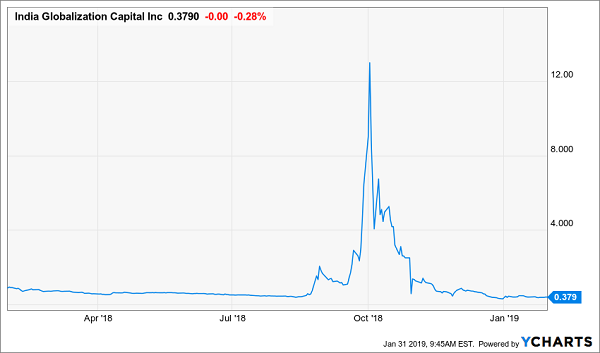 Is it possible to make money slinging crypto and weed-related stocks? Sure. But why would we gamble on any stock price movement when we can completely eliminate that risk and double our money thanks to sustainable dividend payments alone? But what separates dividend-powered mega-trends from fads like Bitcoin? First and foremost, they represent real problems to be addressed, or existing technologies that can be considerably improved upon. For instance, you might not think much about the water in your faucet, but water scarcity is a real concern worldwide – so much so that Cape Town, South Africa, was on the brink of running out of clean water before a series of aggressive measures helped stabilize the city’s situation. The need for water infrastructure alone in the U.S. will require $683 billion in capital spending, across everything from pipe replacements to smart meters, over the next 10 years. That’s not a fad. That’s a mega-trend. And many of the companies that are addressing these kinds of movements are staring monster market opportunities right in the face. 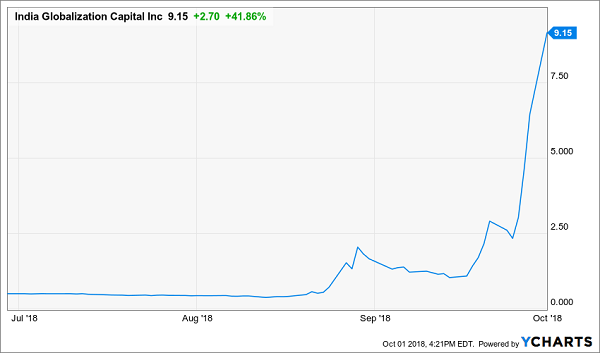 The stock chart of graphics processor and chipmaker Nvidia (NVDA) certainly looks like a bubble bursting. In fact, you’ll notice some similarities between it and the charts of Bitcoin and most other cryptocurrencies. But unlike Bitcoin, Nvidia is assuredly not a fad. Oh, NVDA is certainly in its fair share of near-term trouble. 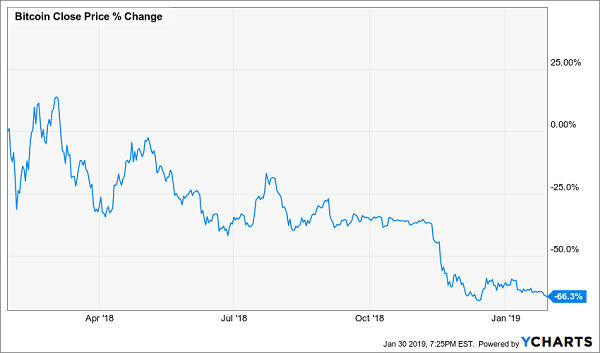 In fact, the stock has lost more than half its value since October thanks to a third-quarter revenue miss and shy guidance (thanks in part to waning sales of GPUs for the purpose of mining cryptocurrency), then recently sank some more as it hacked its Q4 guidance yet again. And it’s not just crypto. Chinese economic growth concerns were cited this time, but other nagging issues are popping up: slow data-center results – something Intel’s (INTC) guidance hinted at – a bumpy launch for its Turing GPUs. This is a reset, and a miserable one for current owners. But for new money? It’s a new opportunity. Nvidia remains on the cutting edge of numerous mega-trends. The company is in fact blending two of these trends via its partnership with ARM Holdings, wherein the two companies will bring deep learning (a type of artificial intelligence) to possibly billions of mobile and IoT devices. Meanwhile, Nvidia is elbow-deep in autonomous-vehicle technology. Volvo announced in late 2018 that it will use Nvidia’s Drive AGX Xavier computer in its next-gen vehicles. That makes it just one of a number of companies using Nvidia’s Xavier technology, including Audi, Mercedes, Volkswagen (VLKAY), Baidu (BIDU) and a score of Chinese motor firms. Also – and this is important – Nvidia still is growing. Even after two guidance cuts, Nvidia still expects to be slightly ahead in sales from where it was at this point in 2017. 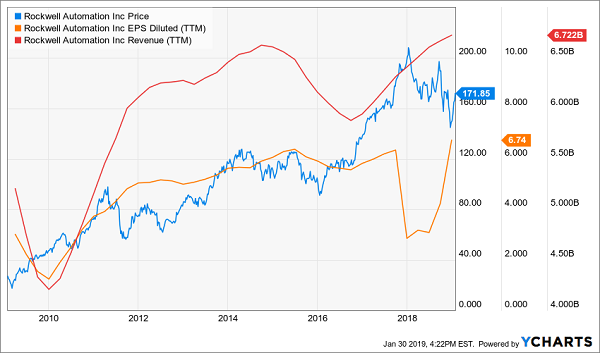 And despite a slew of after-the-fact downgrades, Wall Street analysts still expect roughly 15% annual average profit growth over the next five years, and they still have an average price target of $218 that implies more than 60% upside from here. 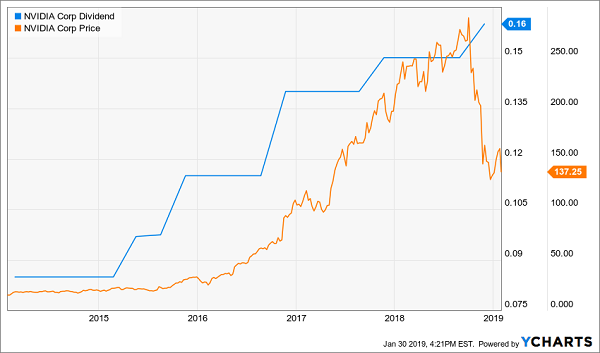 Meanwhile, Nvidia has nearly doubled its dividend over the past half-decade, and should continue to grow that payout going forward. NVDA now trades at a much more reasonable 18 times next year’s earnings, and growth still is very much in the cards as it serves up products for numerous mega-trends. Industrial automation is an interesting mega-trend in that it’s already been going on for decades. There’s no official start date, though Ford (F) gets some credit for popularizing the term in the 1940s. In short, industrial automation is simply the trend toward using systems and equipment to lessen human interaction in the industrial process. This spans everything from a thermostat that regulates your oven’s temperature, to entire systems that can manage processes such as customer and market analysis. Despite a lifespan of more than half a century, there’s still plenty of growth to be had in this continuing mega-trend. Transparency Market Research sees the global industrial automation market to hit a CAGR of 6.6% between 2016 and 2014, eventually becoming a $352 billion business. Rockwell Automation (ROK) is a multinational industrial giant that did $6.7 billion in sales for fiscal 2018, and boasts a presence in more than 80 countries. Its solutions vary widely, from integrated power controls for mining companies to independent cart technology for consumer-product manufacturers to network design and security services for biotechnology companies. Rockwell’s customer list is just as varied, spanning clients from Exxon Mobil (XOM) to PepsiCo (PEP) to Regeneron (REGN) to … hey, Ford. Interestingly enough, the company actually touts a couple of macroeconomic mega-trends driving its own success, including the blossoming of the middle class in emerging markets, and the aging of the U.S. workforce. Rockwell is in a multi-decade uptrend of rising revenues, and is just coming off a first-fiscal-quarter report in which sales and profits both beat analyst expectations. Moreover, Wall Street is expecting modest but consistent growth of 4% annually for the next couple of years, but pushing a 20% total boost in profits over that time. So that’s 20% potential stock upside if its P/E merely stays the same. Moreover, Rockwell Automation also has been growing its dividend like a weed. With an average five-year hike of roughly 11%, ROK sits alongside a small group of stocks whose dividends are on pace to double every seven years or less. I’ve mapped out the explosive potential of the aging of the Baby Boomer demographic for years. It’s one of the most well-known investing mega-trends on the market, spanning several sectors, including healthcare, REITs and even technology. 10,000 Baby Boomers are retiring every day – they have been for years, and will for years to come. A 65-year-old couple likely will have to pay around $275,000 on average on health care in retirement. Medicare spending, currently at 3.7% of U.S. GDP, is expected to hit 5.2% by 2030. Enter Medtronic (MDT), the world’s largest medical device company. Medtronic’s product lineup spans the gamut, covering fields from cardiac rhythm and diabetes to renal care, tumor management and general surgery. Its products fit the bill: They help an increasingly growing elderly population stay alive longer, with a better quality of life. Think pacemakers, brain-monitoring devices and hemorrhoid therapies. Analysts currently have a $102.90 price target on MDT shares, implying 17% upside in just the next 12 months alone. Pair that with expectations for high-single digit earnings growth over the next couple of years, as well as a quickly improving dividend that has plumped up by 80% over the past half-decade, and you have a rock-solid way to leverage a mega-trend that still has many years to play out. Nowadays, we don’t blink at the idea of going online, looking for something we want, clicking a few buttons and having it appear on our doorstep within a couple days. But 20 years ago, Amazon.com (AMZN) and eBay (EBAY) were just pioneering this technology, with online shopping representing a mere $131 million market. In 2018, the U.S. e-commerce market of physical goods was $505 billion … and that should hit $735 billion by 2023. Amazon has led that charge – and threatened scores of companies in the process – but it’s far from alone. Yes, there’s eBay and Overstock.com (OSTK), but realize that almost every brick-and-mortar retailer, from Walmart (WMT) to Gap (GPS), has had to figure out how to sell their wares not just on shelves, but online. High-end kitchen-goods store Williams-Sonoma (WSM) now does more sales on the Web than it does in its stores! But rather than trying to guess which e-tailer will reign supreme, why not latch on to a company that’s riding several companies through this trend? Duke Realty (DRE) is a real estate investment trust (REIT) that boasts 152 million rentable square feet of warehouse and other industrial space across 20 American markets, which it rents out to roughly 1,000 customers. The thing that immediately stands out? Amazon is Duke’s No. 1 tenant, at 6.3% of annualized gross lease value. E-commerce is in fact Duke’s second-biggest business, at 17% of AGLV, and growing. You can see this in its other top tenants, which include not just retailers such as Wayfair (W) and Crate + Barrel, but also transportation firms such as United Parcel Service (UPS) that have been lifted by the increased need of package shipping. Duke Realty is more of a stable-growth play than an explosive-growth prospect just given the nature of the business, but the metrics look good. Duke has more than $1 billion in “dry powder” for growth opportunities, expects high-single-digit AFFO growth looking forward, and of course stands to benefit as long as e-commerce adoption continues to expand. DRE’s dividend growth isn’t screaming, either, but I still love the story there. 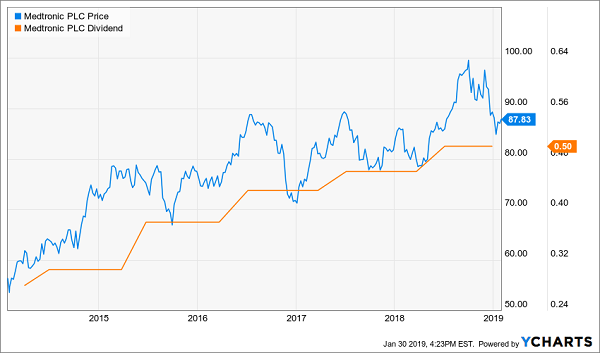 The REIT’s success of the past few years actually kick-started payout hikes after it stagnated at 17 cents per share from 2009 through 2015. The dividend now sits at 21.5 cents per share after a November payout increase, and that figure should keep climbing as you and I continue clicking to buy. Even when I’m chasing down the hottest growth opportunities on Wall Street, I still keep one eye trained on income. Why? Because the companies that have the financial backbone to be able to routinely pay out their shareholders are less likely to be flashes in the pan like Bitcoin, and more likely to deliver steady, substantial growth for decades … all while producing retirement-sustaining income that pays the bills and beats away bear markets. In fact, I have a very specific target when I’m evaluating potential holdings. Each and every stock I buy must be able to churn out at least 12% in safe, annual returns. I’ve weeded out dozens of potential yield traps and companies whose supposed “mega-trends” are actually just one or two years from dying out. What remains is an all-star roster of picks that will deliver the double-digit annual returns you need to retire worry-free after decades of busting your hump. 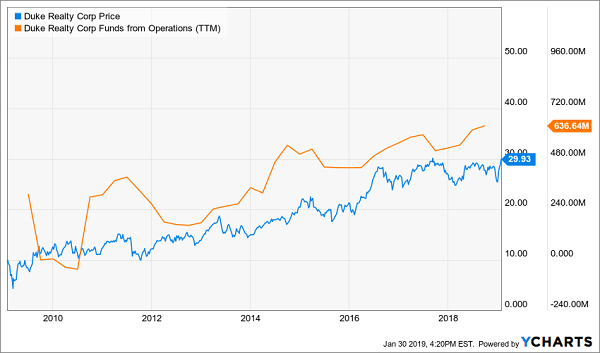 Stock A has already boosted revenues 129% over the past five years, and has at least another decade of double-digit growth left in the tank! Stock B is a “double threat” income-and-growth play that rose more than 252% the last time it was anywhere near as cheap as it is right now! Stock C has almost $5 billion parked overseas, money that could come rushing back into investor’s pockets in the next year (or less)! This portfolio delivers everything: capital gains, nest egg protection and three times more income than most retirement experts say you need! Even if it “merely” hits its target of 12% returns annually, you’ll double your portfolio’s worth in just six years! Plus, it’s built to be more durable against market downturns like 2008-09, which wrecked scores of retirement accounts across America. It’s easy to see how this portfolio will give you the retirement you’ve planned for all these years. The dividend income alone will tackle your monthly bills, while the growth will leave enough left over for all the extras – the vacation home, the kitchen remodel, the second honeymoon to Bali. All the while, you’ll be able to grow your nest egg, which acts as extra protection against life’s ugly surprises. 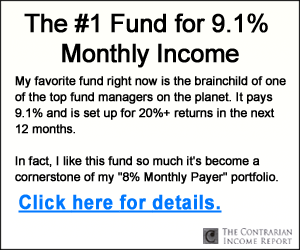 Let me teach you how to earn 12% for life. 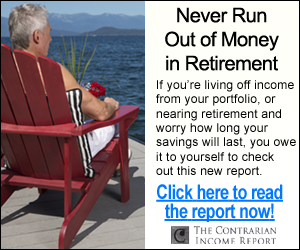 Click here and I’ll GIVE you three special reports that show you how to double your nest egg every six years. You’ll receive the names, tickers, buy prices and full analysis for seven stocks with wealth-building potential – completely FREE!